Panorama of a portion of the cliff-line at Denny Cove, said to provide some of the best rock-climbing routes in the Southeast. The Denny Cove tract is expected to add over 150 top-quality rock climbing routes to the park, and become a major regional destination for climbers. Volunteers have been working with SCSP Rangers Jason Reynolds and John Ball since August 2016 to build new access trails into Denny Cove, the latest addition to the park. “There is a lot of trail to build, in order to access all of the new rock climbing areas and other natural features of the Denny Cove tract,” Ranger Ball noted. 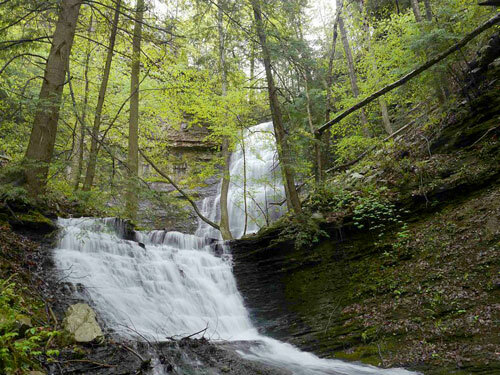 The Access Fund, a climbing advocacy group, and Southeast Climbers’ Coalition (SCC), with help from the Friends of South Cumberland and other like-minded organizations, closed on the purchase of the 685 acre Denny Cove tract in late July, 2016. The Denny Cove tract was dedicated and officially opened to the public in March of 2017. Previously held by a Brazilian timber company, Denny Cove is a nearly pristine parcel with outstanding cliff-lines, making it a priority acquisition for climbing enthusiasts. Over 150 world-class climbing routes have already been identified on the bluffs at Denny Cove, located just off US 41, two miles south of the entrance to Foster Falls. Denny Cove is now officially a part of South Cumberland State Park, making SCSP the largest state park in the Tennessee State Park system.